Samsung Galaxy Grand was a great success in India. Indians love large screen phones and a sub 20K device from South Korean Giant offering a 5 inch display was an instant hit. Samsung is all set to launch its successor, Samsung Galaxy Grand 2, with faux leather back and enhanced hardware, tomorrow and the price range is expected to be around 20,000 INR. 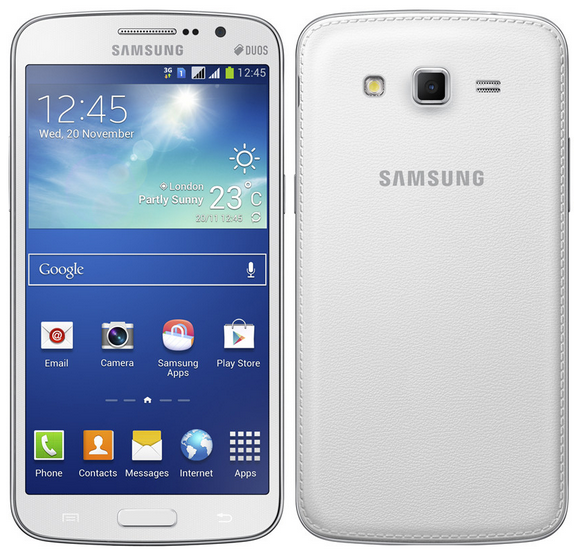 Let’s take a look into how far Samsung Galaxy Grand 2 has evolved with respect to its predecessor. The camera specs remain similar to the predecessor. The Samsung Galaxy Grand 2 comes with an autofocus 8 MP camera at the back supported by LED flash. The camera comes with all usual features including Geo-tagging, touch focus, face and smile detection, image stabilization. The camera is capable of full HD 1080p video recording at 30fps. The secondary camera of 1.9 MP, capable of HD video recording, is also present for video calling. The Internal storage also remains same at 8 GB. The internal storage can be extended to 64 GB which means, most users won’t have any storage issue. The Samsung Galaxy Grand 2 will most likely support USB OTG and this would solve all your storage woes. The Processor employed has 4 CPU cores clocked at 1.2 GHz, which means 2 extra cores and better processing power. The RAM capacity has also been increased to 1.5 GB to ensure smooth multitasking and gaming. The make of the processor has not yet been specified, but if the cores are as good as seen in Samsung Galaxy Grand Duos, you can expect a solid performance. Battery capacity has been enhanced to 2600 mAh and will reportedly give you 17 hours of talk time and 450 hours of standby time on 2G. Apart from being an improvement over its predecessor, this will give Samsung Galaxy Grand 2 a huge advantage over domestic branded devices which boast of high end specs with severely limiting battery. The Display resolution which was a limiting factor in Samsung Galaxy Grand Duos has now been improved to 720 x 1280 HD. This shoots up the pixel density to 280 ppi which is decent enough to enjoy multimedia content on the larger 5.25 inch display. The Dual SIM phone also comes with Android 4.3 Jelly bean O.S. out of the box, which is not as fancy as Android KitKat, but will suffice for now. Samsung is reportedly testing low end devices for KitKat update and if this is true, you can expect KitKat update on Galaxy Grand 2 in the near future. In spite of Domestic manufacturer’s showing innovation in body design and build quality, many people consider the budget android phones as cheap knock off of Samsung Devices. The Sleek body design of Samsung Galaxy Grand 2 with only 8.9 mm thickness along with larger display, thinner bezel and the Faux leather back last seen in Samsung Galaxy Note 3 makes it stand apart from the crowd. Kudos to Samsung for including the faux leather back in Galaxy Grand 2. This phone will be available in White, Black and Pink colors. Connectivity features include HSPA+, WiFi, Bluetooth 4.0 with A2DP, Micro USB 2.0, GPS with AGPS support and GLONASS. The SAR Value is also quite low at 0.44 W/Kg which is good news for those conscious of radiations from their electronic devices. Samsung Galaxy Grand Quattro was another Quad core device with Samsung branding for around 15,000 INR but Samsung Galaxy Grand 2 is bigger and better. Main competitors of this phone will include phones like Micromax Canvas Turbo, Google Nexus 4, Gionee Elife E6, HTC Desire 500 and Sony Xperia C.
Samsung has focused on the looks of this smartphone and has managed to eliminate shortcomings like lower display resolution and fewer processor cores. With the competitive pricing and Samsung Branding, we expect this device to be an instant hit and for now it seems to deserve all the hype it has garnered. can u pls confirm this that this device support USB OTG? SGG itself does not support USB OTG. u have mentioned SGG2 would support as like SGG. is wrong. So SGG2 does it support USB OTG or not ? In today’s release can u get the information ?